Huff Run Watershed Restoration Partnership (HRWRP) hosted four separate Awareness Day Field Trips this May, bringing almost 600 students out into the watershed. This event has been an annual program for over eleven years, and this year was by far the largest Awareness Day that HRWRP has ever hosted! In May, four public schools attended the field trip. Tusky Valley seventh graders started the line-up of field trips on May 1 by enjoying a typical spring day with a mixture of rain and shine. Conotton Valley’s Sherrodsville Elementary sixth grade and Sandy Valley fifth grade students had fun in the sun on May 15. On May 20 five home school groups came to the Mineral City Park for a day filled with acid mine drainage tie-dying, learning about groundwater, streambank ecosystems, and erosion. Finally, Carrollton’s Bell-Herron seventh graders enjoyed a beautiful day on May 22. These students had the opportunity to visit a restoration site in the watershed, as well as conducting water quality tests, learning about wetlands, collecting macroinvertebrates (aquatic bugs), and watching the OEPA as they performed electrofishing. Zoe Shepherd and Jaime Sheppard from Bell-Herron said, "The trip to Huff Run was fun and exciting. Our favorite part was the macroinvertebrates. We got to go in the water and scoop macros out using a net. We also learned about other stuff like fish shocking, acid mine drainage and water quality. The 7th graders who go on this trip in later years are going to enjoy it like we did!" Ohio Department of Natural Resources; Ohio EPA; Carroll, Tuscarawas, and Jefferson County Soil and Water Offices; Rural Action; Local Township Trustees; and HRWRP members volunteered over 350 hours of their time to make the field trips possible. 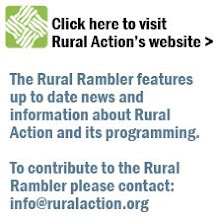 Funding for Awareness Days was provided by Rural Action’s US EPA Targeted Watershed Grant. The Countywide Recycling and Disposal Facility donated money for volunteer lunches and Mineral City United Methodist Church donated the use of their facility for the field trips. HRWRP began holding these Awareness Days eleven years ago to help underscore the importance of educating our youth about the environment, so that future generations will be able to live in a sustainable manner with regard to their watersheds. If you would like to help with this event next year or want to learn more contact Huff Run’s Assistant Watershed Coordinator, Amber Leasure-Earnhardt (amber@ruralaction.org) or call the HRWRP offices (330.859.1050).